EJ Samoyeds is located in Ladd Illinois. Founded by Erica. Samoyed Club Of America member. Since owning our first samoyed "Tazz" we have grown to love and respect this breed and the wisdom of learning in their eyes. We believe to have a samoyed is to have a good Temperament,good Health and overall Structure for the ring and for the home. Our Future goals are to take Pure English lines and combine them with American lines to produce a balance of both type and structure. The future well being of this breed lies in the hands of the breeders that take the time to educate not only themselves but of the future owners of this breed. Here I hope you can find some educational links to help in any questions you might have about the breed. Please do your research if you think you want a Samoyed. There are many people out there "breeding" these dogs and doing a disservice to the breed and the dog-owning public. Finding the RIGHT breeder takes time, and is worth the effort. Ask questions, look at contracts, and get references! I hope this page is helpful to you. Please feel free to contact me with any questions or comments you may have. Wonderful informative site straight from a vets mouth! This is our girl "Dasha Lucerne Crittic's Choice" Call name "EmMe". We picked her up from her breeders in Canada. She is being shown in U.K.C until she matures some for the A.K.C ring. If you want to see her pictures and show updates click on her photo. Here is our first Samoyed "CH. Bepa's Razz Ma Tazz Of Ej" call name "Tazz". Wait for me at the bridge until we Meet Again! 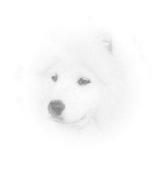 is owned by Ej Samoyeds.